Magic, Mystery and Music: Bella Venezia! 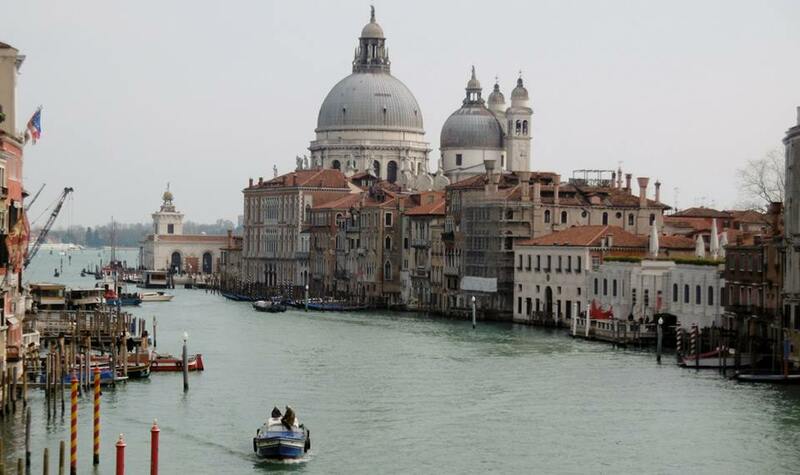 The first time I visited Venice, I went with my mum and dad. I was seven. We walked around San Marco Square and visited Murano to watch the glassblowers. My parents shipped a gorgeous set of red cut glass glasses and decanters to our home. My mum still uses them. The last time was 24 years ago when I went with my girlfriend, Max. We stayed in a funky little hotel overlooking a small canal, visited open air markets and ate gelato (among other things). Coming back again this week, I was nervous I might damage some of those precious memories and that Venice might not live up to my expectations. From the moment Skip and I stepped onto the waterbus from the airport and spotted the iconic domes and towers across the canal, I was in love again. And the feeling grew with every step, every stone bridge, every winding cobblestone alleyway and every ripple from every passing gondola. There’s a magic about this city that’s woven into the fabric of the centuries-old marble and narrow waterways that weave between the buildings. Splashes of pink, purple and yellow flowers decorate wrought iron balconies, tiny piazzas (or campos) contain water cisterns (for collecting drinking water in days gone by) and alfresco café tables covered with red tablecloths are scattered throughout the city, offering glasses of Campari, homemade pasta and freshly-baked pizza (though not in wood-fired ovens due to fire hazards). Tiny stone bridges span the canals, walking or boating is the only way to get around and every shop is bursting with colourful, decorative glasswork, soft leather handbags and painted feathered carnival masks. Everyone we came across was warm, welcoming and helpful and we sensed a joie de vivre in the attitudes and lifestyles – from shop owners to hotel receptionists to congenial gondoliers decked in traditional black and white striped shirts with jaunty straw boaters. Walked the streets – Every nook and cranny and each cobblestone road offers delightful treasures that unfolded before our eyes: Tiny shops bursting with exquisite glass, cafes hidden in piazzas where musicians set up impromptu concerts, immense churches filled with marble statues, mosaic floors and soaring 10-foot ceilings, stone bridges where we stood and gazed at the magnificent views as gondolas and boats floated beneath our feet in a choreographed water dance. A tiny orchestra plays in the middle of San Marco Square. Attended a Vivaldi concert – While strolling around San Marco Square on our first day, Skip was drawn to a small church with classical music floating from the door. To his delight, he discovered there was a concert happening that evening – Vivaldi’s Four Seasons – in the birth city of the composer – taking place in an intimate church setting with incredible acoustics and some of the loveliest sounds we’ve heard in a while. Such a treat could only set the stage for the rest of our magical visit. Took a gondola ride – While it may sound touristy, it’s a once-in-a-lifetime experience. Rates are officially set by the city so there’s no haggling or bargaining and the “basic” 40-minute ride costs 80 Euros. Our gondolier, Tiziano, paddled us through hidden waterways we’d never normally see, showed us the homes of Marco Polo and Casanova (“the first great lover but not the last”, he laughed) and told us there are 432 gondoliers in Venice. The profession is handed down from father to son and the number of licenses are capped so you have to inherit the job in order to be a gondolier (Tiziano is fifth generation gondolier in his family). Visited the islands – The son of the owner of our hotel, Alessandro, offers private boat services so we booked him for an afternoon to see Murano, Burano and Torcello, three of the 118 (or so) Venetian islands. Starting in Murano, we were treated to a display of glass-blowing from one of the “Master” glassblowers, then shown around the building where each of Murano’s 50 Masters has a room to display his art: from exquisitely designed shimmering chandeliers to intricate mirrors and sculptures, sets of elegant wineglasses and dozens of figurines, animals, candlesticks, perfume bottles and ornaments – all created by craftsmen who, like gondoliers, pass their craft from father to son through the generations. Next came Burano, a small island where lacemaking is the primary craft and each building is painted in a different colour, creating a backdrop of blues, pinks, greens and purples that blend into a gorgeous assortment of whimsical design. Last was Torcello, population: 50. Considered the birthplace of Venice, it’s here on this tiny island we visited the awesome Cathedral of Santa Maria Assunta and saw the 12th and 13th century Byzantine mosaics. The colourful little island of Burano. And, of course, since we were in Italy, we found food. Gelato shops filled with mounds of flavours from dolce di latte to KitKat, fresh pasta hanging in windows, wine barrels filled with inexpensive Chianti and Valpolicella where you can fill a bottle and freshly baked pizza on every corner. We discovered churches and museums along the way that I sometimes stopped into, sometimes didn’t. For me, the charm and magic of Venice is in the streets, and the best way to experience the city is to stroll slowly throughout her alleyways, cobblestone passages and tiny winding paths between buildings. In a shop window one day, I spotted a promoting their wares which read “Quality. Love. Passion. Tradition”. The same applies to Venice. P.S. : Check out the video of the boat ride across to the islands on a wild, windy day. Beautifully written, Gabi. Note to self: Go there!